The Colonel DeWitt Clinton Baxter Camp #72, department of New Jersey was originally organized in August 1982. Baxter Camp #72 was officially chartered in August 1983 with 17 members on its rolls. From that time until July 1994 the Baxter Camp worked actively, albeit quietly, in its rural South Jersey locale. At the July 1994 meeting it was voted to change the camp name to that of Lyon Camp #10 to align the camp more closely with Lyon Post #10 G.A.R. headquartered in Vineland, New Jersey. Lyon Post #10 G.A.R. was one of the largest posts in the South Jersey area. There were a number of local posts, however, only the records and artifacts of Lyon Post #10 remain. All others are lost to history. Baxter Camp #72 held its meetings at the Vineland Historical Society, Vineland, New Jersey. 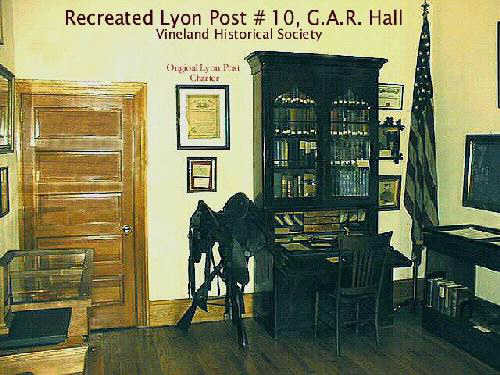 One of the projects of Baxter Camp #72 was the establishment of a room within the Historical Society which would appear as a meeting room of the Grand Army of the Republic's Lyon Post #10 of Vineland circa 1900. A great many relics of Lyon Post #10 G.A.R. were found in the historical society's building and the Baxter Camp members assumed the responsibility of arranging them into a display. The Vineland Historical Society generously assigned a room to Baxter Camp members for organizing and displaying Lyon Post #10 artifacts. With a few months work, a wonderful early 1900s styled meeting room took shape, complete with period furniture, relics, personal artifacts and the records & minutes books of Lyon Post #10. After a year of business meetings conducted in this nostalgic and historic atmosphere, the Brothers elected to assume the name of the old Lyon Post #10 and become Lyon Camp #10 SUVCW. We have enjoyed having Grandsons and Great-Grandsons of original Lyon Post #10 members either join our camp or make presentations before the assembled Brothers. We have made a great effort to bring the City of Vineland, N.J. a treasured piece of her past and bring into a sharp new focus Vineland's Civil War Veterans. Today, Lyon Camp #10, Department of New Jersey, SUVCW continues to maintain and upgrade the G.A.R. room at the Vineland Historical Society. During the Historical Society's annual "open house," many brothers bring in Civil War relics and G.A.R. memorabilia from their personal collections. These go on display in the G.A.R. room filling it with Civil War history. With Lyon Camp being a "uniform camp" (members have the option of attending meetings and events in Civil War uniform) our participation in the Society's open house lends additional historical color making the G.A.R. room one of the high points of the display. At the end of each Lyon Camp #10 meeting several sets of minutes from Lyon Post #10 G.A.R. are read aloud. Members also often give reports or talks on Civil War related subjects. They also share biographical material of family members who served in the war. Currently Lyon Camp #10 SUVCW maintains several active committees. They include G.A.R room repair and upkeep, member lineage, G.A.R. room documentation (Every artifact has been photographed, identified and docketed. ), grave registration, camp historical, membership and fund raising. hall using many original artifacts from Lyon Post #10 G.A.R. Co A 1st Rgt Eastern Shore Inf. Md. Co B 7th West Virginia Cav.